Vertical view of the magnificent steeple of Christ Church. To better appreciate the height of the steeple, just click directly on the photo, to enlarge it. Historic Christ Church is an Old City Philadelphia institution, dating to the seventeenth century. Its Burial Ground was constructed in 1719, and its most famous resident is Benjamin Franklin - who was buried there in 1790. But he is just one of five Signers of the Declaration of Independence in the graveyard. We include Franklin's Grave on our One Day Tour of Philadelphia, for those of you with limited time in Philadelphia. Christ Church is nearly as old as the city of Philadelphia itself. William Penn founded the colony of Pennsylvania in 1682; just 13 years later, in 1695, Christ Church appeared. Penn was a Quaker, and one of the primary reasons for his interest in the colony was to provide a refuge for the minority sect in the New World. However, a condition of the charter which he received from King Charles II, mandated that an Anglican church (i.e., one which would serve the faith of the vast Anglican majority that existed in England at the time), be created in the new colony. That having been said, Penn genuinely had a very strong belief in religious toleration. Other sects were welcome, and churches to their faiths appeared also, even though they were not mandated by the British Crown. So an Anglican church appeared as part of Penn's "Holy Experiment" - and even if it hadn't been required, Penn certainly would have permitted it, anyhow. The church you see today, dates "only" to 1744, but remains one of the many pre-Revolutionary War buildings that survive in Philadelphia. Its steeple was designed by one of America's earliest architects, Robert Smith, in 1754. Christ Church marks the beginning of its existence in 1695, when the property it currently sits on, on 2nd Street just above High Street (now Market Street), was purchased. In 1696, construction commenced on the first physical Christ Church. By January 1698, three carpenters in the congregation declared that it was completed. It cost about 600 British pounds at the time - roughly 81,000 pounds today - and about $136,000 in U.S. dollars, today. By the summer of 1700, though, it was already deemed too small for its Anglican congregation, despite having been completed less than three years earlier. Its first belfry was up by 1709, with two bells, one a "Great Bell" and the other a "little bell" which rang to commemorate "publick Rejoysing days" - although the belfry was not always operational. Later on, Christ Church had its own minister's residence, school house, water pump, stable, and by 1719, the Christ Church Burial Ground at 5th and Arch Streets. musical peal was cast by Lester and Pack, who are at present the most noted and ingenious artists of that kind in England. They were hung by Nicholas Nicholson, a native of Yorkshire, in a manner the most convenient and entirely new. And when a clock for the chimes is added, which he seems very desirous of, they will be the compleatest sett in America. The new church continued to grow along with the American colonies in America in general and the city of Philadelphia in particular. Of course, then the Revolutionary War came, in April 1775. Many members of the two Continental Congresses attended service at nearby Christ Church, although many were not Anglicans. Benjamin Franklin, who would eventually be laid to rest in the Christ Church Burial Ground, had made his most famous invention, the lightning rod. Of course, one of the cutting-edge fire safety devices rested on top of the tallest structure in his adopted city of Philadelphia. On June 9, 1777, lightning struck the steeple and broke the lightning rod. Philadelphia, then as now, had frequent electrical storms in the summer. But this particular lightning strike was viewed as a harbinger of bad tidings, given the fact that the colonies were now at war with Great Britain. Moreover, the war was not going well, and the year, with its three sevens resembling gallows, was known to pessimistic American patriots as "The Year of the Hangman". Philadelphia, as the capital of the new nation, was known to be the target for British General Sir William Howe. And less than four months after the lightning strike, the city was,in fact, captured and occupied. The city fell in the fall of 1777, after Howe defeated George Washington and the Continental Army at the Battle of Brandywine on September 11, in now-suburban Chester County. Of course, Christ Church - like all Americans, loyalist and patriot alike - had to maneuver to ensure that the fortunes of war did not leave its building in ashes. After the American defeat at Brandywine, the city knew it was doomed to occupation. Four days after the defeat, on September 15, the clergyman in charge of Christ Church was (understandably) disconcerted by the news that there were unexpected individuals in the steeple taking down the eight bells! Fortunately, they were Patriots who wanted to ensure the bells' safety before Howe and the British Army reached the city; there was concern that they would be melted down by the British for cannonballs and ammunition. The Americans managed to spirit all eight of them out of the city and into safekeeping in distant Bethlehem, where they sat out the occupation. 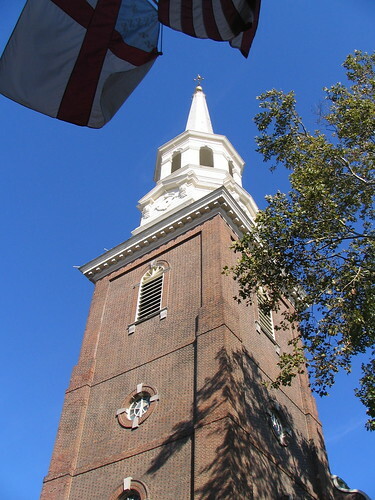 After Howe evacuated Philadelphia in June 1778, nine months later, the bells were returned to Christ Church and rehung. It is closed for visitors on New Year's Day, Easter Sunday, Thanksgiving, and Christmas. In addition, it is closed on Mondays and Tuesdays in January and February, the slowest months for visitors. Visiting Christ Church is free, but a $3 donation for adults, $2 for students, is suggested, in order to defray the cost of maintaining the church. Christ Church is located near 2nd and Market Streets, in Old City. Specifically, it is on 2nd Street, just above Market, with its official address as 20 North American Street. Between April 1 and Halloween, the best way to get there is via the Phlash Trolley. It stops at 3rd and Market Streets on its westbound loop from Penn's Landing, and at 2nd and Market on its eastbound loop to Penn's Landing. Unfortunately, it only runs for six months. It is also easily accessible via SEPTA. The Blue Line / Market-Frankford Line / "the el" conveniently stops at 2nd Street/Old City, right outside the church. Also, many SEPTA buses travel in both directions, to and from Penn's Landing, up and down Market Street. Just confirm, by asking the driver when you board, if the bus will be going to 2nd and Market. SEPTA Regional Rail also offers service that takes you to 11th and Market Streets, just nine blocks away. To do so, just take any inbound Regional Rail train to Market East Station. 1) You can walk to the Blue Line stop at 11th Street, and you can do that without even going outside. Just walk from the train platform and following signs for the Blue Line. When you arrive, make sure you follow signs reading "Eastbound to Frankford", and go to that platform. The ride to the 2nd Street / Old City station will take only a couple of minutes. From there, just walk up 2nd Street and you're there. 2) You can take any eastbound SEPTA bus, heading to Penn's Landing. Just confirm, by asking the driver when you board, that the bus is heading towards Penn's Landing. Then disembark at either 2nd or 3rd Streets. 3) You can take a cab. The distance is only 0.8 miles from Market East. This has the advantage of being very quick, and would take you directly to the door. And, if you have a large party, it might be both cheaper and easier, than SEPTA. The cab driver might not recognize Christ Church, however, so ask to be taken to "2nd and Market". 4) If the weather is pleasant, and/or you would enjoy the exercise, you can certainly do the nine-block, 0.8 mile, 15 minute walk there. This also permits you to see all of the other attractions, along Market Street. Just head east from 11th until you get to 2nd Street. Finally, you can get the most detailed information for planning your visit, at the official Christ Church and Burial Ground web site. and in particular, its page for Visiting Us. This map shows Historic Christ Church, which is the red teardrop on the right, and its Burial Ground, which is the red teardrop on the left. They are separated by about 0.6 miles. If you'd like to leave Christ Church and Burial Ground, and return to the home page of Enjoying Philadelphia, please click here.